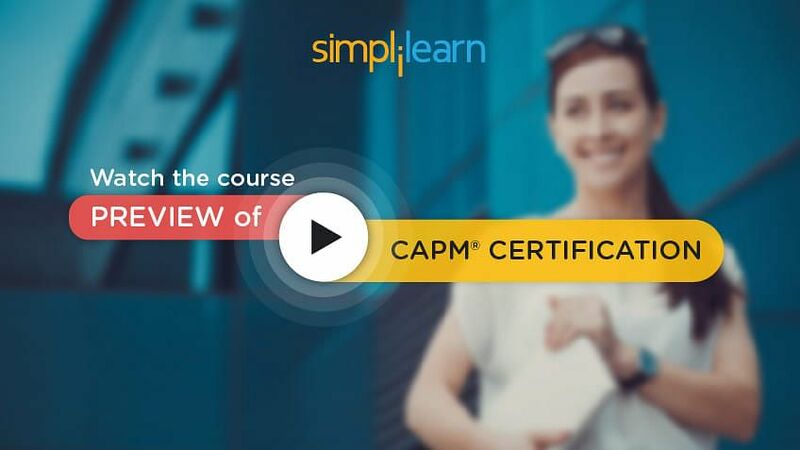 Welcome to the second lesson ‘Project Management Processes’ of the CAPM Tutorial, which is a part of the CAPM Certification Course offered by Simplilearn. In this lesson, we will focus on project management process. Let us now begin with understanding the differences between project life cycle and project management process. Project lifecycle addresses the question, “What to do to get the work done?” It varies industry wise. For example, let us look at a typical project life cycle in the software industry. First, you understand what is required and analyze it as part of the requirement analysis phase. Then, as part of the design phase, you figure out the implementation of it and arrive with the approach. Next, you implement the functionality by writing the code as part of the coding phase. The code is then verified to ensure it works right, as part of the testing phase. The tested and verified software is then installed at the customer locations, as part of the installation phase. After the installation, the system then moves into operations and support phase. The processes for managing the projects are likely to be the same across industries. For instance, in the develop schedule process, one needs to develop the project schedule, irrespective of the industry or domain you are working. In the next section, let us understand the project management process group. Note the iteration of processes within the phases is dependent on the scale of the projects. Small projects may have only one iteration, whereas bigger projects may have multiple iterations before they enter a new phase. Project management processes are overlapping activities. Note that each of the Five Process Groups is assigned a particular color as shown below. This color scheme is followed throughout the tutorial. The initiating process group is shown in yellow, planning in blue, executing in red, monitoring and controlling in green, and closing in grey. Let us look at the interaction between these activities in the next section. Note that production of the plan is not a one-time activity. As the project progresses, the project management plan may get updated as a result of the monitoring and controlling processes. The updated project management plan once again forms an input to the execution process group. In the next section, we will discuss the project management process group, knowledge area, and project management process mapping. Given in this section is the list of the forty-seven project management processes, ten knowledge areas, and five process groups. The table shows how each of them is interrelated. You can see that the Project Integration Management processes can be mapped back to all the five Process Groups, while Project Scope Management processes are mapped back to only planning and monitoring process group. Take a look at the table to identify processes under project management and the knowledge area they belong to. All the 47 processes are described in detail in this tutorial. Let us discuss each Process Group to know the input and actions taken during the process. The initiating process group formally starts a project after considering the business case and establishing the feasibility of the project. Typically, the initiating processes will result in the authorization or official approval for a project or a new phase within that project to begin. A project charter is a document that authorizes a project. It is basically a formal “go ahead” on the project and is issued by the organization’s senior management. The project charter has information such as the project manager, and stakeholders of the project, what is the product or service of the project, high-level risk, cost, schedule, etc. Let us now look into the inputs to the initiating process group and the actions taken during the initiating process. There are various inputs in the initiating process group. The first is the project statement of work. The statement of work is typically provided by the project sponsor or whoever is initiating the idea. If the project is started under a contract or an agreement, then the contract or an agreement is the input. If the project is undertaken to meet some business need of the organization then the business need is the input. You will frequently come across the terms Enterprise environmental factors and organizational process assets throughout this tutorial. Enterprise environmental factors include everything that defines the context in which the work of the project will be performed, including the organization structure, culture, political environment, etc. Organizational process assets include all of the organization’s past data about working on similar projects, the process templates, and know-how that can be used by the project manager. If the project is being done as part of a contract with an external customer, the procurement documents also form inputs to initiating processes. Now, let’s look at the actions that happen in an initiating process group. One of the actions that happen is reviewing the statement of work and business case. The most important one is to decide which project is to be taken up for execution from the list of probable projects. Once the project is decided, the next action is deciding the project manager and his or her authority in terms of the kind of decisions he or she can take. The high-level risk, assumptions, and constraints are also identified during the project initiation phase. Along with this, the high-level project organization and the number of phases in which the project would be executed are also decided. The feasibility of the project is established. The key stakeholders are identified; their interest in the project is documented. The senior management decides whether the project is feasible, has a valid business driver, and whether the organization is able and willing to work on the project. If the answers to all the questions are affirmative, the project is authorized. You may get questions in the CAPM exam, based on the inputs and activities of the initiating process group. The planning process group determines if the objectives laid down in the project charter can be achieved and prepares a blueprint of how the project will be accomplished. Now, let us look at the specific actions taken during the planning process group. Usually, the starting point for planning is the requirements. The requirements need to be analyzed and the project team needs to convert them into specific deliverables, which become a part of the project scope statement. The team also needs to break down the scope into smaller manageable work packages in the form of a work breakdown structure. The project manager also works on getting the approval on the project scope by the stakeholders. The team comes up with the baseline plan for scope, cost, and time. The core team members for the project are selected and the quality standard of the project is determined. The management framework for risk management, identification, analysis, and response planning is put together. Any procurement activity required by the project is also identified. Other actions determine what needs to be purchased, how to execute and control the project, documenting the project management plan, and how to handle updates on the plan arising out of change requests. All these actions described above are documented in the project management plan. Note that planning is not a one-time activity. Re-planning, i.e., making changes to the plan in response to change requests, is also an integral portion of planning. The purpose of the executing processes is to complete work in the project management plan and to meet the project objectives. The focus is on people management, following processes, and ensuring everyone in the project has the same information about the project objectives. The stakeholders are also updated. Resource calendars, which contain the availability of the resources for project work, various project documents, including plans, registers, checklists, etc. Let’s look into the actions that take place during the executing process. Managing stakeholder engagements involves ensuring that stakeholder’s expectations are in line with project charter and none of the stakeholders have unrealistic expectations. Completing and delivering the work packages as planned is the “doing” of the actual project work. Ensuring that quality standards planned in the project management plan are being followed. Producing the project progress report and sharing with all the stakeholder. Sharing this report ensures that everyone has the same information about the progress of the project. If there are any bottlenecks in project execution, they are resolved during project execution phase. Team building and training activities are organized to increase team members’ productivity. Approved changes, corrective, and preventive actions are implemented. If the project requires any third party component, getting the sellers to respond to the project requirement, and finalizing these procurement arrangements is also done during executing phase. The purpose of the monitoring and controlling process group is to measure project performance as per the project management plan and take appropriate action. This process group tracks, reviews, and regulates the progress and performance of the project; identifying and initiating any areas in which changes to the plan are required. The appropriate action can be in the form of corrective and preventive actions. Monitoring means observing and controlling, that is, to take actions to bring things under control. holding status review meetings, etc. A project is considered complete not when the project’s product is delivered, but only when all the closure formalities have been completed. The closure includes administrative activities such as collecting and finalizing all the paperwork needed to complete the project and the technical work to verify that the product of the project is acceptable. Remember that PMI expects a mature organization and a certified project manager to be diligent about bringing projects to an orderly closure and use the performance data and lessons learned for planning future projects. This process group also includes work related to transferring the project’s product to those who will maintain and use it and return all the project resources to the resource pool. release the resources from the project. There are 47 processes in project management grouped into ten Knowledge Areas and mapped to five Process Groups. Initiating Process Group defines a new project or phase. When the project charter is approved, the project is officially authorized. Planning Process Group establishes the total scope of effort, objectives, and course of action required to attain those objectives. Executing Process Group completes the work defined in the project management plan to satisfy the project specifications. Monitoring and Controlling Process Group tracks, reviews, and regulates the progress and performance of the project; identifies and initiates the changes to the plan when required. Closing Process Group finalizes the activities across all Project Management Process Groups to formally complete the project, phase, or contractual obligations. With this, we have come to the end of this lesson. In the next lesson, we will cover project integration management.